Just before Gap Adventures' new Expedition began its European season today, The Cruise Examiner had a look at her in Portsmouth, from where she is leaving for Oban. Meanwhile, this Thursday sees the introduction of Compagnie du Ponant's Le Boréal and two American small ship operators, one of which is about to take on a new name, search out new itineraries. Last Friday in Portsmouth, Gap Adventures invited tour operators and agents from both the UK and Continent to tour their ship and sample a typical dinner - at lunch time! In addition to an excellent meal, visitors were treated to a thorough examination of the new ship, freshly arrived and receiving a new coat of red paint after its first successful Antarctic season. Being a former Baltic ferry, the Expedition is graced with very light and bright public areas. The forward lounge and lecture room and the ship's restaurant above it both offer views forward and to both sides of the ship. The lounge is equipped with tub chairs and banquettes at the sides, all fastened to the deck to ensure that they don't become projectiles during the sometimes rough crossing of the Drake Passage between Tierra de Fuego and the Antarctic Peninsula. Likewise, the dining room has some good-looking furniture and all the chairs are fastened to the deck. Off each side forward there are also wings that offer a slightly more private area with several tables on each side. This dining room is quite unique as it is the only one The Cruise Examiner has ever seen, other than on some night ferries, that is mounted up forward on the top of the ship below the bridge. Further aft on the same deck as the dining room is the Polar Bear Bar, a convivial social space that also offers views on three sides at the aft end of the ship. At 6,336 gross tons and carrying 116 in lower berths (the ship's eight triple cabins give her 124 berths), she offers a passenger space ratio of 54 tons per guest. With crowded ships scoring as low as 20, roomy ships above 40 and luxury ships about 60, this is a very good indication of just how roomy this new expedition ship is. Also in this league is the Akademik Ioffe at 59 (6,450 tons, 109 passengers) but the Expedition well exceeds Lindblad's National Geographic Explorer at 44 (6,471 tons, 148 passengers). Although only four years newer than the Explorer, which Lars-Erik Lindblad first introduced in 1969, the Expedition, which was built as a sturdy ice-strengthened ferry in 1972, has already proven to be a worthy successor to this little ship, which was lost in the Antarctic in November 2007. The Explorer, which was at the end owned by Gap, has actually been replaced by two ships if one considers that National Geographic Explorer, a former Hurtigruten ship, has also taken the original ship's name. 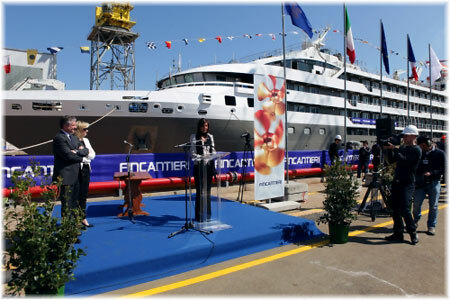 Two weeks ago, Compagnie du Ponant launched its latest ship L'Austral, the second of two super luxury cruise ships the French owner has ordered from Fincantieri's Ancona shipyard, due to enter service in 2011. Meanwhile, the first, Le Boréal, makes her maiden voyage this week, sailing from Marseilles on Thursday. In terms of size and sophisticated décor both ships resemble large mega yachts. They will both fly the French flag and measure 10,700 gross tons on dimensions of 466 feet in length and 59 feet in beam. Some 260 guests will be accommodated in 132 cabins and suites, all with a sea view, and of which 94% have a private veranda. After her first season in the Mediterranean, Le Boréal will head to the Antarctic, where she will be chartered to US operator Abercrombie & Kent for the winter season. There she will succeed the Minerva, which they had been operating as Explorer II, and the original Explorer, which it had sold to Gap Adventures. Compagnie du Ponant, whose head office is in Marseilles, is the only French-flag cruise line to operate a fleet of deep sea ships, the others being one-ship operations. Its current fleet of three ships (Le Ponant, Le Levant and Le Diamant) will soon rise to five, serving a super-luxury customer target. Founded in 1988, Compagnie du Ponant is a member of CMA CGM Group, the world's third largest container line, which itself carries passengers on many of its ships serving Australasia, the Americas and Asia. Its French West Indies line offers weekly service between France and Martinique and Guadeloupe with twelve-passenger ships while it also offers frequent service to China with the largest passenger-carrying container ships in the world, accommodating up to ten passengers each. Founded in the 1960s by Luther Blount, the American Canadian Caribbean Line is not only introducing new itineraries but is also about to take on a new name. From the originators of the first New England to Saguenay River itineraries via the Erie Canal in the 1960s, 2010 see the introduction of a brand new itinerary between New York and Toronto. Taking 9 nights in each direction, the Grande Mariner will depart New York's Chelsea Piers on August 14 and proceed by way of the Hudson River, Erie Canal, St Lawrence Seaway and Lake Ontario to Toronto, with calls at Troy, Little Falls, Oswego and Ogdensburg in New York and at Kingston, Port Weller (for Niagara Falls), Hamilton and Toronto in Ontario. The reverse itinerary leaves Toronto on August 25. 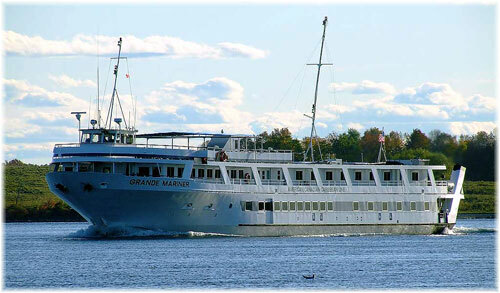 Further, ACCL is looking into cruises in Ontario's Georgian Bay, once such a popular haunt for Great Lakes cruise ships that the last of the Great Lakes operators was actually called the Georgian Bay Line. Soon to be announced as well will be a name change for the company, which in honour of its founder, is apparently about to become known as Blount Small Ship Adventures. Meanwhile, on the west coast, Cruise West, long famous for its Alaska trade, has introduced several new itineraries in recent years, in the Antarctic and the Galapagos, and on the Danube River, by chartering dedicated vessels from other operators, as well as sending its own Spirit of Oceanus on a new 335-day globe-circling world cruise, which it has recently announced that it would repeat for 2011. These efforts have been successful that the small ship operator is now polling its customers for indications of interest for new itineraries involving the Mississippi River, the St Lawrence Seaway between Montreal and Toronto and the Hudson River. No details have been announced but itineraries are apparently being developed for 2011.